It's the Friday before a big tech event, so that only means three things: leaks, reports and rumors. Among the whispers are a few rumblings suggesting a new Android keyboard could make an appearance at Google's shindig in NYC Monday, perhaps as part of an Android 4.2 update. 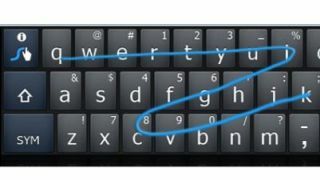 The new keyboard is rumored to have Swype-like functionality, where users trace their finger over letters as an alternate typing method. It is unlikely that the keyboard would actually feature Swype, which was bought last year by voice-recognition company Nuance. Rather, it is more fitting of Google's style to update its official keyboard while Swype remains an alternative for users to choose in the Google Play store. Nexus Keyboard not the default? Despite the report, changing the default Android keyboard may be too large of a shift for Google, as well as for some users. Google's new keyboard may also take the form of a separate Nexus Keyboard app. As a separate app, the rumored Nexus Keyboard would match Google's pattern of offering alternatives to its own default Android services. Google Maps, Google Mail and most recently Google Calendar have all broken off as independent apps to offer additional features compared to Google's default counterparts. Perhaps more importantly to note, HTC and Sony have both begun preloading Android smartphones produced by the companies with native Swype-like keyboard. A Nexus Keyboard app would step on far fewer OEM toes than a fundamental change to the default keyboard. The rumored Nexus Keyboard could make its debut with the frequently leaked LG Nexus 4 handset, which is expected to be one of the featured devices at the event. A Swype-like keyboard is on TechRadar's Android 5.0 Key Lime Pie wishlist, but Google could still surprise us with a Nexus Keyboard update before the new OS surfaces.